Spaceweather.com posts daily satellite images of noctilucent clouds (NLCs), which hover over Earth's poles at the edge of space. The data come from NASA's AIM spacecraft. The north polar "daisy" pictured below is a composite of near-realtime images from AIM assembled by researchers at the University of Colorado's Laboratory for Atmospheric and Space Physics (LASP). When is the best time to see auroras? Where is the best place to go? And how do you photograph them? These questions and more are answered in a new book, Northern Lights - a Guide, by Pal Brekke & Fredrik Broms. This is actually a Space Weather Buoy--a lunchbox containing a cosmic ray detector, cameras, GPS trackers, a thermometer and other sensors. It flew to the stratosphere on August 22nd tethered to a suborbital helium balloon. In collaboration with Spaceweather.com, the students of Earth to Sky Calculus have been launching these buoys on a regular basis to study the effect of solar activity on Earth's upper atmosphere. Soon, they will release results from a year-long campaign covering altitudes of interest to aviation, space tourism, and ozone research. The students wish to thank Eden Botanicals for sponsoring the August 22nd flight. (Note their logo on the corner of the payload.) This was the student group's 58th successful launch--almost all paid for by a combination of donations and commercial advertising. Readers, would you like to sponsor the next flight of the Space Weather Buoy? 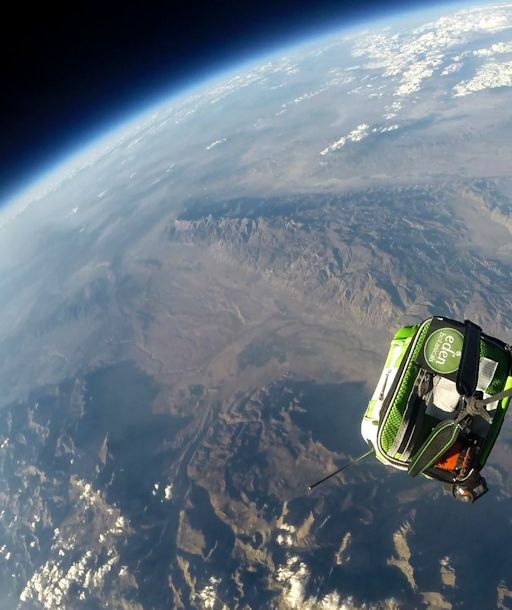 For only $500 you can send your logo to the edge of space and help students continue their explorations of the stratosphere. Contact Dr. Tony Phillips for more information. The source of the blast was sunspot AR2151. As the movie shows, an instability in the suspot's magnetic canopy hurled a dense plume of plasma into space. 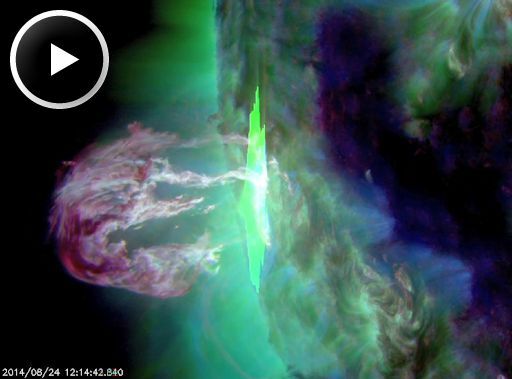 If that plasma cloud were to hit Earth, the likely result would be strong geomagnetic storms. However, because of the sunspot's location near the edge of the solar disk, Earth was not in the line of fire. Even so, the flare did produce some Earth effects. A pulse of extreme UV radiation from the explosion partially ionized our planet's upper atmosphere, resulting in a Sudden Ionospheric Disturbance (SID). Waves of ionization altered the normal propagation of VLF (very low frequency) radio transmissions over the the dayside of Earth, an effect recorded at the Polarlightcenter in Lofoten, Norway: data. On Aug. 25, 2014, the network reported 7 fireballs. On August 25, 2014 there were 1495 potentially hazardous asteroids.